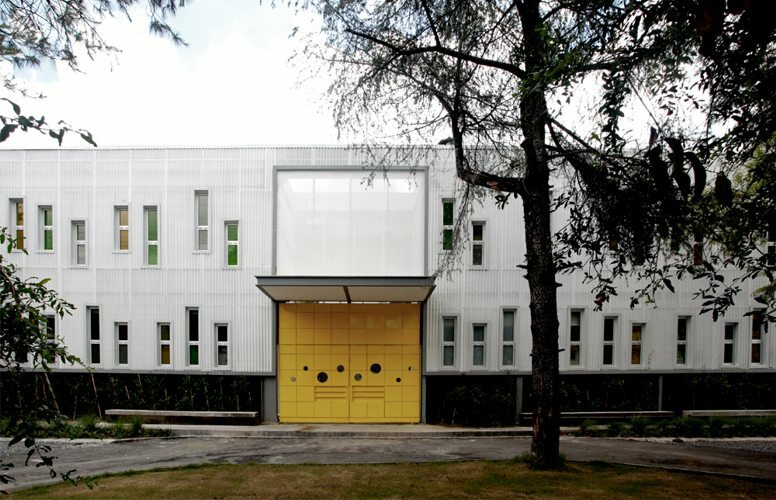 The new Docet Institute is a preschool in Monterrey, Mexico that was designed with a sensitive eye toward children’s needs, energy requirements, and the wooded downtown property it is sited on. The interior is spacious and light-filled, and it wraps around to preserve a natural area with mature trees. 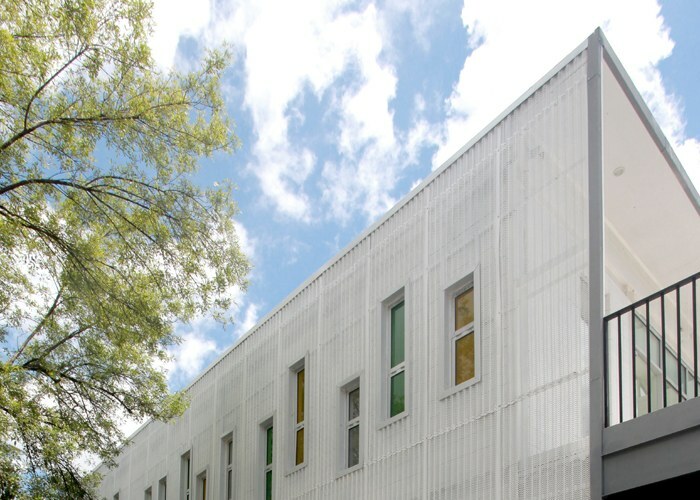 The architects at Stación-ARquitectura Arquitectos took the brilliant step of wrapping the school in a breathable metal skin to reduce heat gain, which in turn substantially lowers operating costs for the school in the balmy Mexican climate. The school is located along a main street in town, on a site that featured a number of mature trees. The trees were preserved by carefully placing the building, which has an L-shape. The gauzy façade was developed by the architect and manufactured at a local machine shop. To create it, corrugated steel sheets were punched and coated with a white paint. The sheets are installed on a block wall and provide protection from the sun in addition to a unique, soft profile that fits within the project’s limited budget. The interior is light-filled thanks to an open floor plan and carefully-placed skylights. Open view corridors and interior windows help parents and teachers mind the children’s activities. Lighting leaves can adjust during daylight hours to save energy and lower the building’s reliance on heating systems. Outside, the children get to play in a preserved habitat, exploring the natural world.